IDSA Board of Directors Education VP Ayse Birsel presented the Student Merit Awards (SMA) to representatives from IDSA's five District Design Conferences (DDCs): Geemay Chia of the Cleveland Institute of Art; Rachel Lopdrup of Auburn University; Mauricio Romano of Western Washington University; Rotimi Solola of University of Illinois-Chicago; and Zach Stringham of Syracuse University. The Educator of the Year was presented to Owen Foster, IDSA, who believes classrooms are not limited by walls—and that every experience is an opportunity to learn something new. Foster’s background spans industrial design, architecture, landscape and environmental design. Foster has served as chair of the Industrial Design Department at the Savannah College of Art and Design since 2010. He’s gained recognition for co-founding and co-directing the SHIFT Design Camp. While they “Explore, Build and Lead” for a week every summer in the Alabama outdoors, dozens of high school and university students from across the country are mentored by teachers, designers, artists and industry leaders. 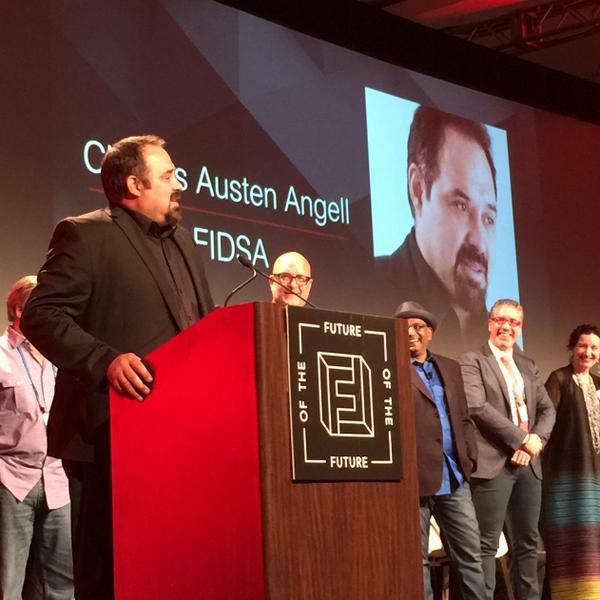 Past IDSA Board of Directors Chair and current Chair Emeritus, Austen Angell, FIDSA, presented the Chair Award to an IDSA member who has worn many hats. Cooper Woodring, FIDSA, served as IDSA president; executive vice president; interim executive director; IDSA New York Chapter chair—and the mayor of a village in New York. Woodring joined IDSA in 1967. He received an appointment from President Ronald Reagan to head the US Information Agency’s Cultural Exchange Mission called “Design in America” behind what was then the Iron Curtain. He was also the first industrial designer to address The Conference Board, the prestigious Fortune 500 organization. Woodring testified before the US Congress to advance design and his works have been represented at MOMA and the Smithsonian, and been recognized with more than 30 US design and utility patents. Woodring also co-founded IDSA’s Design Protection Section and has co-taught expert witness seminars. Three new members were inducted into the IDSA Academy of Fellows for earning the special respect and affection of the membership through distinguished service to the Society and the profession. Brian Roderman, FIDSA, announced two inductees. Austen Angell, FIDSA, IDSA’s current Chair Emeritus previously served as Board Chair; New Website Committee Chair; Executive Director Search Committee Chair; Chair Elect; Chair of the 2012 International Conference in Boston; Executive Vice President; Midwest District Vice President; Midwest District Design Conference Chair in St. Louis and in Madison, WI; Wisconsin Chapter Chair; Pod Moderator; INNOVATION magazine Guest Editor; Design Foundation original Trustee and Formation Team member; and Design Foundation current Trustee. Angell also founded Modern Edge, a strategic industrial design firm based in Portland, OR. Previously, he served as director of design research and innovation for Intel Corporation. Angell holds a bachelor’s degree in industrial and product design from Purdue University. The next inductee was Julie Heard, FIDSA. who’s been an IDSA member for nearly a quarter of a century. She recently wrapped up a two-year term as the Board of Directors’ Chapter Vice President. She also served as Chair of IDSA’s Texas Chapter for six years. Heard is a founding partner and an owner of Mixer Design Group, based in Austin, TX. She has directed work for Qualcomm, Dell, HP and Texas Instruments. Previously, she worked as an industrial designer and project manager at Design Edge. Heard’s work has been recognized by IDSA’s International Design Excellence Awards (IDEA); and by G-Mark, American Product Excellence and CES Innovation awards. She holds several design and utility patents. Heard earned a BFA in industrial design from the College for Creative Studies, where she also belonged to the IDSA Student Chapter. Patricia Moore, FIDSA, announced this year’s final inductee. RitaSue Siegel, FIDSA, joined IDSA in 1988. She wrote the book on ID recruiting, and has been called a pioneer in the field. She was named the professional recipient of one of the highest accolades in industrial design—the 2015 Rowena Reed Kostellow Award. Siegel is the founder of a recruiting firm bearing her name that influences design, business, media and education. Siegel was the 2011 recipient of the IDSA Special Award; an IDEA juror; one of 30 global creative thinkers invited to the inaugural INDEX design summit in Copenhagen; and a member of the Design Management Institute’s Board of Directors. She holds bachelor's and master's degrees in industrial design from Pratt Institute, and served as the school's director of placement. Siegel contributed to Communication Arts and Business Week magazines, and authored several books including American Graphic Design, Thirty Years of Imagery and Getting a Design Job.